A few weeks ago I stumbled upon the game engine Godot and I decided to give it a try by learning how to use it for creating a 2D platform game. This blog post contains a walk-through of the different parts of this endeavour. The source code for my game is completely free and is available from GitHub so just go ahead and download and experiment with it as you like. Godot is an open-source game engine with a light-weight development environment that runs on OS X, Windows and Linux. The games can be deployed to the mentioned OS:es and also to iOS, Android and HTML (with WebAssembly and WebGL). I’m using Godot 3.0 that was released in late January 2018. The engine supports both 2D and 3D development but the focus in this tutorial is solely on 2D. For scripting the game logic, Godot supports several different languages (among them C# with mono in Godot 3.0). I use the default, Python-like, GDScript. There are so many things I like about Godot. It’s free, open-source, multi-platform for development, multi-target for deployment and very easy to use. The main benefit for me is that Godot allows for building the game objects in different scenes which makes development easier and it also encourages re-use of the game objects. As the stable version of Godot 3.0 is quite new, there are not many tutorials available yet. There are many guides on Godot 2.0, but as much has changed for Godot 3.0 all 2.0-information is not applicable to the new version. Nodes for a scene tree can be defined in the Godot editor but you can also instantiate nodes from code which is very useful when you need to spawn many objects with random parameters. I started out by creating the player character. This is implemented in a separate scene (stored in the player.tscn file). The player is a KinematicBody2D object. This object type handles collisions with other objects automatically and it also sees to that the object is moved to a non-collision state after a collision. For custom detection on when a KinematicBody2D object overlaps another object you need do some coding. More on this further down in this post. The player scene has an animated sprite with a Particle2D object that creates a visual effect when the object is hit. The CollisionPolygon2D object covers the essential part of the object for collision detection. The object also has some AudioStreamPlayers for sound effects and two timers that triggers the the sound effects and animations when the object has been hit. The player scene has a Camera2D object. This makes it possible to scroll the view as the character moves. For rapid development of the core of 2D levels, a TileMap can be used. A TileMap is a node where you can draw with tiles from a TileSet. A tile set can be created by first creating a separate scene where you add sprites with collision nodes. 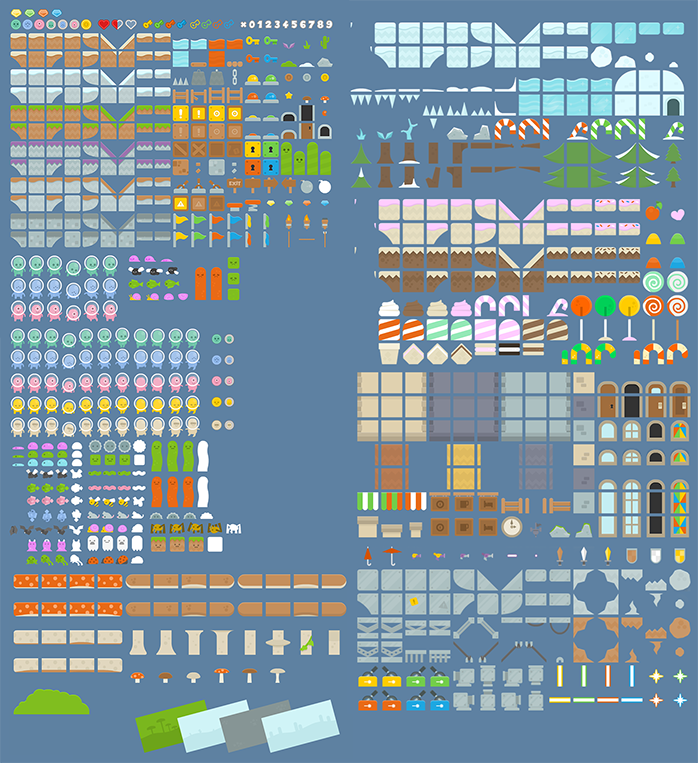 Then you can export this as a tile set resource that can be referenced from a TileMap. TilSet scene with a tree of sprite+StaticBody2D+Collision nodes. This scene can be export to a TileSet resource file. Create a new scene that contains a TileMap object. On this object you can link to your created tile set resource file. After this you can draw with your tiles. If you set the grid size of the TileMap cells to map your tile size, they will align properly in the editor. TileMap with the tiles from the TilSet available to the left. The player object is a KinematicBody2D object and I have not found a good way to do custom collision detection with other objects from within KinematicBody2D. Thus, I go the other way around: From a collision between my player object and an item, I let the item send a notification about the collision. This is possible because the items are Area2D objects that implements a body_entered event. The level scene is updated to handle the star_taken signal. The level code routes the signal so that it can be handled by the main scene (for counting the score/points). The enemies are implemented in a similar way as the items. I draw a Path2D points on the level but I want the enemy objects to follow the path between the points. For this purpose the Path2D object has a PathFollow2D sub item. The PathFollow2D allows for getting an arbitrary offset position along the Path2D curve and these positions are used for moving the enemies around the path. In the tile map there is a particular tile that should have special treatment – the ladder. The player should not collide with this tile, but when the player is on the ladder, the player character should have a special animation and be able to climb up and down. Also in this state, the player object should not be affected by gravity. In the script for the player scene I check if there is a tile map node available as parent. If so, I convert the player’s position to a tile map position (with world_to_map) and check what tile exists on that position. If it is a ladder tile, the player character is on the ladder. The HUD (Heads Up Display) shows the current score and level, health and level complete status. This is implemented with Godot’s label control objects that are wrapped within split containers. The HUD controls has a CanvasLayer parent which makes the controls stick on the same position on the screen even though the rest of the game world is scrolling. When the game is running you can press ESC for pause. This shows a menu where you can resume, restart and quit. There are also menu options available when you reach the states Level complete, Game over and Game complete. I created short background tracks with Logic and Absynth that I exported to ogg format for each game level. I also recorded some sounds for the player character (also exported as ogg files). The sounds are handled by AudioStreamPlayer objects and are triggered at different times within the game. To get a more vivid background I added a ParallaxBackground object with a ParallaxLayer sub node with a tiled background. Godot is great!! Love it! I still have much to learn but I am very eager to continue working with this game engine.